Yesterday I shared photo and details from the dessert bar for the Olivia the Pig birthday party I recently planned. Today we’ll go over the other decor and activities during the party. 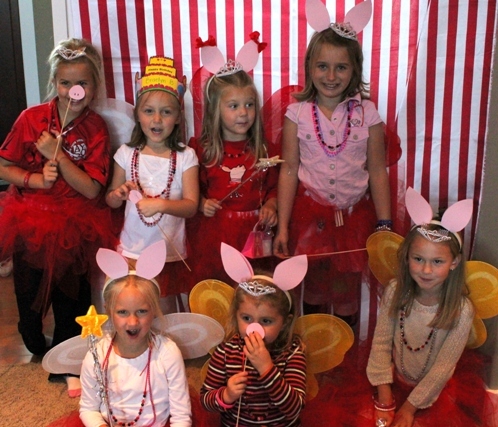 Setting the scene for the Olivia the Pig “Princess” Birthday Party was so much fun! Red and white decor with prints in stripes and polka-dots were the main focus. 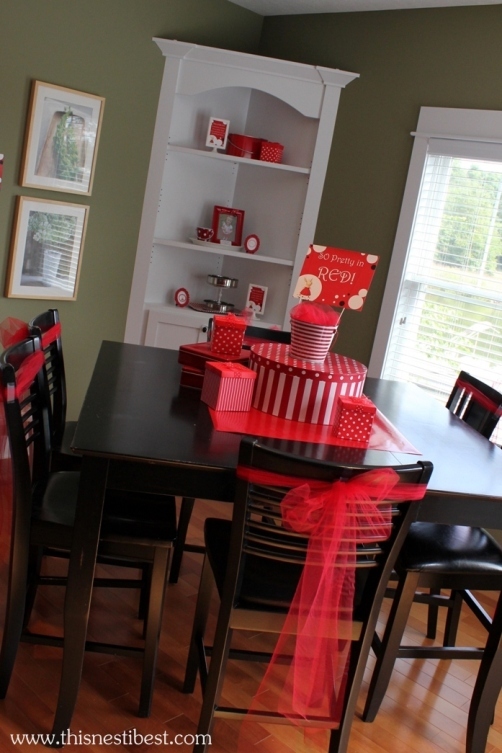 The pops of red throughout the living and dining rooms really made the space feel so festive! In the living room, we set up tables and chairs for the girls and covered them with red and white polka dotted wrapping paper (yes, wrapping paper again!). 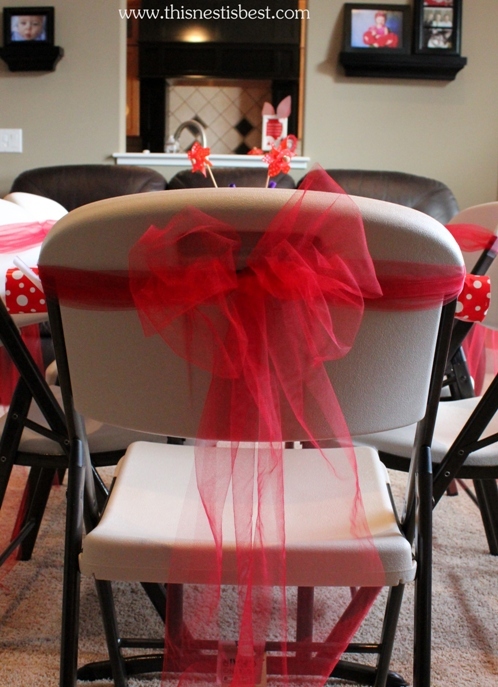 All of the chairs received a large tulle bow – a little touch of “princess” for the decor! The dessert bar was also set up in the living room so guests would see it as soon as they walked in the door – it really created a focal point for the room. 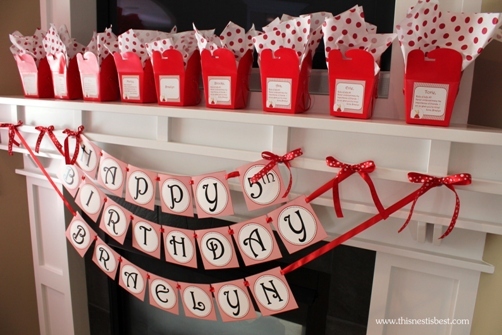 We also lined up the girls’ goody bags (red Chinese takeout boxes with polka-dotted tissue paper) on the fireplace mantel with a tiered Happy Birthday banner hanging below. I designed several Olivia “Rules” signs to showcase around the room – my favorite was “For some reason, headbands make you feel faster.” Love it! The dining room continued the theme of red, white, stripes and polka-dots with more rules signs. Early on, Braelyn’s mom and I had decided that creating a “costume room” for the girls would be the highlight of the party – and we really couldn’t have been more correct! 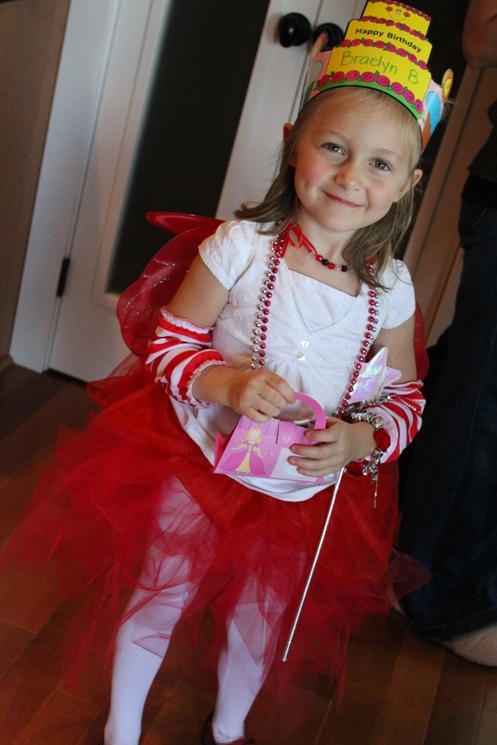 Each girl received a pair of fairy wings, tulle tutu, wand, crown, ring and purse. This was definitely the “princess” aspect of the party and the girls were SO excited to pick out their princess accessories and get their photos taken! There were even squeals of delight as they lined up to enter the much awaited costume room! I think the fact that we waited to do this part until the end really added to their suspense and excitement to finally go in! This was such a fun party to plan and I really thank Braelyn and her mom for letting me be part of their day! This entry was posted in Event Portfolio and tagged red, white. Bookmark the permalink. Super job on everything Rebecca! The decorations were so great it felt like we were at Olivias house! The treats were all incredibly yummy. And the girls seemed to enjoy all the activities, especially the dressup! How cool was that….to get to take their Olivia outfits home. I would encourage anyone to have one. Thank you so much! It was so fun to work with Melanie on everything! noticed you via YHL…this is super cute! Love the party! I would like to copy some of your ideas. Can you tell me where I can purchase the picture frames and the rules that went inside of them. Thanks so much! The picture frames are the Tolsby from Ikea and I made the rules signs – if you are interested in using them, please send me an email. Thanks! Hi! I am helping my daughter prepare for my granddaughters 3rd birthday and we are doing the Olivia the pig theme. Just love what you did at your party. Is there a kit somewhere for the Rules of Life cards you did? Love her rules, so CUTE!! I’ve sent you an email Brenda! Hi there! Love all of the ideas! 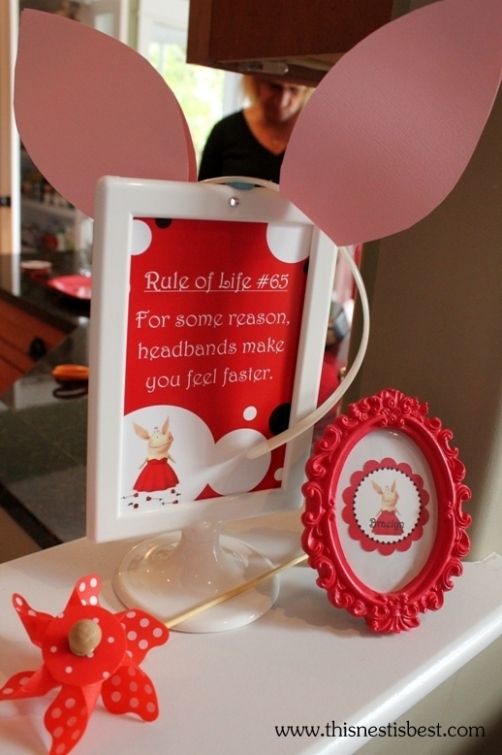 I would also love to use the rules signs – I got the picture frames from Ikea – just need the printables if possible!! Such a cute party, saw you on Pinterest. I am helping a friend plan her daughter’s 4th birthday which is an Olivia theme. Can I ask where you got the fairy wings and tutus from? Thanks! 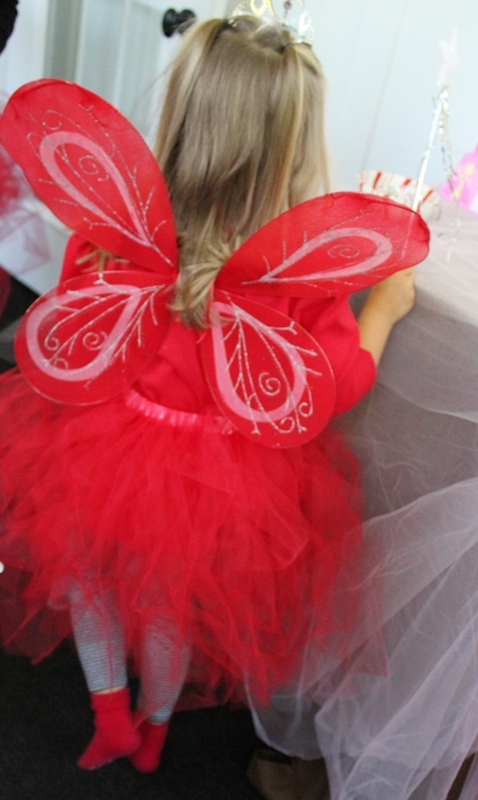 The fairy wings were purchased from a dollar store! I made the tutus from a no-sew pattern online. Good luck! 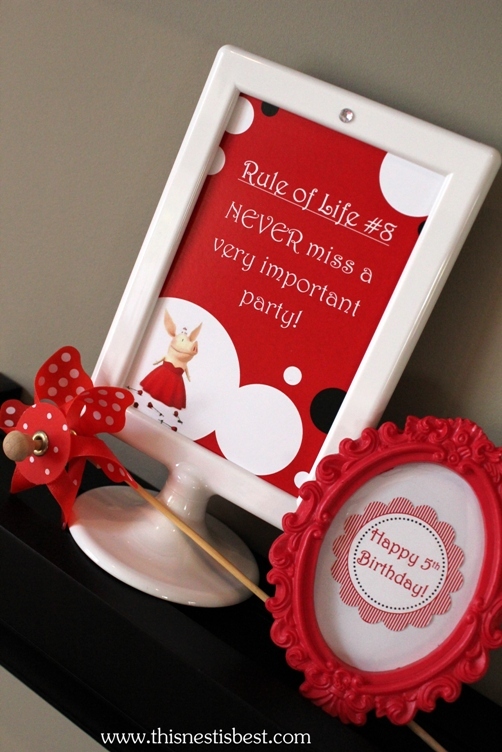 This is such a great theme for a party and so cute can u tell me where you got the rules that you have inside the picture frames and the necklace kit Thanks so much! Nicole, thank you so much! I designed the rules signs and the necklace kit – if you are interested in them, please send me an email at thisnestisbest@gmail.com. Thanks again! I designed the name labels on the red boxes – please send me and email at thisnestisbest@gmail.com if you are interested in using them! 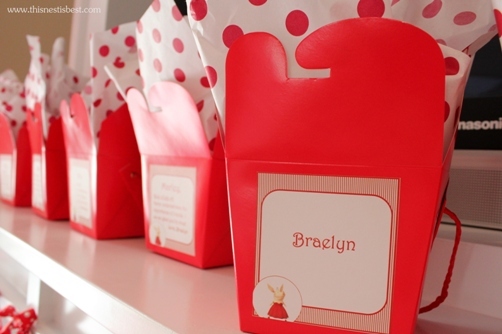 The red Chinese boxes were from the dollar store, but I’ve also seen them at Michael’s! They were empty so the girls could put all of their new princess jewelry inside! Good luck with your party! Adorable!!! Everything was so cute. 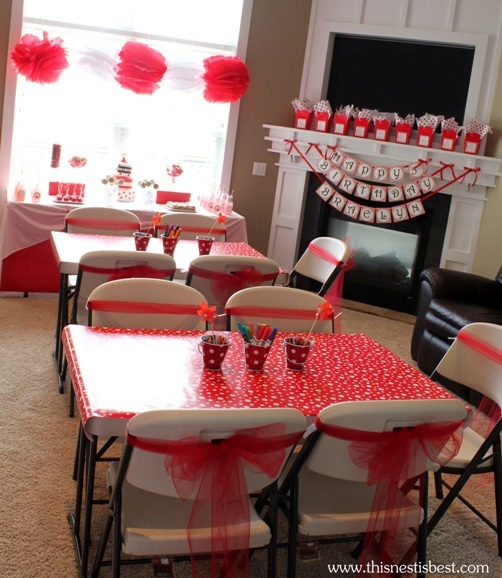 Where did you find the red w/ white polka dot table cloths and cups? Marcie, the “tablecloths” were actually wrapping paper and the polka-dot tins were from a craft store called Hobby Lobby. I am planning an Olivia the pig party and would love to use the precious rules signs you made if possible. Love all the other decor you did for party looks great! I love the pig ear headband idea. What material did you use to make the ears? I am throwing a 3rd birthday with boys coming too. Any ideas on what they could dress up as? 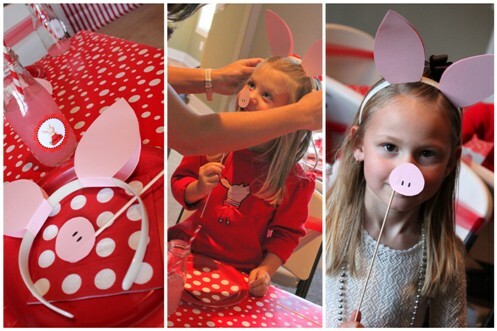 Teresa, the pig ear headbands were made from pink scrapbook paper hot glued onto a headband! Perhaps boys could dress as Olivia’s little brother Ian – they can still get ears and a nose that way! I would love to use the Rules also for my daughters 4th birthday coming up!! Misha, I’ve sent you an email! Love all your ideas :) I’m having a party for my daughter on 9/23. 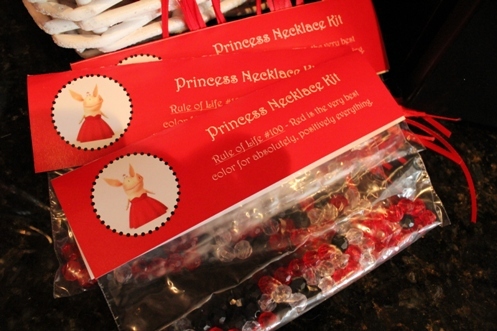 I’d love to use the rules sign & princess kit! So glad you liked the party, Mari! I’ve sent you an email regarding using the printables! I’ve sent you an email, Ashley! Thanks! Hi! I am planning my daughter’s first birthday and we are doing the Olivia the pig theme. Just love what you did at your party. Is there a kit somewhere for the Rules of Life cards you did and the labels? Love her rules, so CUTE!! Thank you Rosnaida! I’ve sent you an email. Thank you so much! I’ve sent you an email. Love all the Olivia Party you did…Amazing! 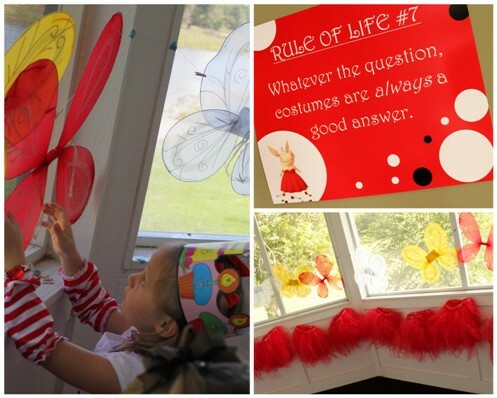 I’m doing the Olivia theme for my daughter’s 5th Birthday…could you please send me the templates of the rules. Thanks so much! Absolutely adorable, thank you for sharing! Found the party via Pinterest and will be using some of your ideas (hope you don’t mind, smile). Best wishes on your party, Janet! Let me know if I can help! Kim, I’ve sent you an email! Hi! I love all your ideas with this party. Could you tell me how you made your Birthday Sign and necklace kit? I was wondering if you are still willing to provide the ‘rules’ signs you created. I’m planning an “Olivia” party for my daughter, Olivia (!) at the end of October, and would have so much pleasure in displaying your rules. Obviously, I meant to say “Rebecca”! Can you tell I’m trying to do too many things at once!! Love your party ideas! So many things I never would’ve thought of. I’m wondering if you’re still willing to share your rules of life signs? I’m having an Olivia party for my daughter Olivia’s 3rd birthday & can’t wait to use some of your ideas. The rules of life signs are the best! :-) Thank you! I second all of the sentiments above. What a party! So, I too would like the rules/labels on the lemonade jars. On that note, where did you purchase the lemonade jars?